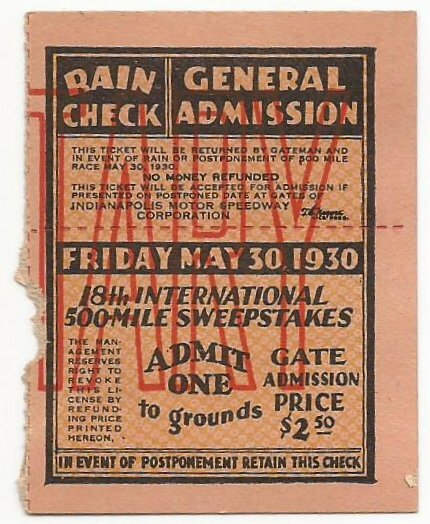 The 1930 grandstand ticket stub continues the same format of 1929 with rain check at left and large portion at right. It is a little larger than the '29 measuring 4 4/5" x 2 3/5". The Argus Ticket Co. Chicago again appears as the ticket printer and is located at the bottom center of the stub. T.E. Meyers Vice. Pres. appears vertically on the rain check and E.V. Rickenbacker, President appears on the large portion which will remain the same for all grandstand tickets from 1930 through 1941. Note the letter "D" has been punched in the ticket at right which corresponds to the stand. It is uncertain as to what circumstances a stub would be punched i.e. 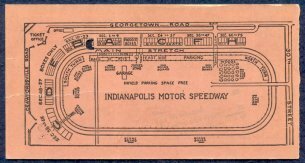 were they punched upon initially entering the stand, leaving or coming back to the stand etc.. Like the 1929, a diagram of the track appears on the back and will remain so in one form or another for all grandstand tickets through today. Unless there is a need to show the back of grandstand or general admission tickets from 1930 through today, no pictures will be shown of them. The general admission changes in size to 1 9/10" x just under 2 1/2" with the rain check above and admission portion below. Again as with 1929, a design appears on the back of the general admission ticket. The ticket printer is the same as the grandstand ticket for 1930 and is located on the large portion at left. There is no printer listed on general admission stubs for those of 1931 through 1941. T.E. Meyers, Vice Pres. appears on all general admission tickets from 1930 through 1941. Note on the large portion of the general admission ticket there is a serial number on the left hand side. A serial number was probably* on the large portion of the 1931 general admission ticket as well. The ticket above would've been to the right of the large part below. For 1931, the size changes on grandstand tickets to 4 3/4" x 2 1/2" but stays the same dimensions for the general admission. The "Arcus Ticket Co. Chicago" appears on the front and also on the back at center. Both 1931 and 1932 general admission tickets have designs on the back and the used '31 & '32 unused general admissions are complimentary. The 1932 grandstand is the same size as 1930 and the general admission is the same size as 1931. The "Arcus Ticket Co. Chicago" appears only on the back. Note the design of the left hand side of the unused “Complimentary” general admission ticket. Too bad you didn't get to keep that part! 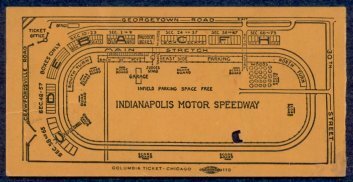 For 1933, the grandstand changes in size to 4 4/5" x 2 3/5" and a new ticket printer, "Columbia Ticket - Chicago" appears on the back and vertically at left by the rain check on the front. Note that the "PRESS" grandstand stub is just like a regular grandstand stub except the word "PRESS" replaces the ticket price information at center front. Note the “Bleacher” grandstand ticket has a serial number. The general admission narrows to 1 3/4" but grows in height to 3 1/4". The back is blank, unless noted, and the size remains the same through 1941. A serial number appears again on the front of both* the small and large portion of the general admission ticket and it will remain so through 1941. The 1934 ticket stub is wider at 4 9/10" and the height is 2 3/5". "Columbia Ticket - Chicago" is on the back only. The "PRESS" stub follows the same format as the 1933 "PRESS" stub. The general admission press stub also has "Press" in place of the ticket price information - it is the same for all press general admission stubs through 1941. Note on the unused general admission “Press” ticket the serial number has been punched in the ticket on the left hand side. The 1935 grandstand ticket stub changes in size to 4 3/4" x just over 2 1/3" and remains so through 1941. A new ticket printer, "Weldon, Williams & Lick, Ft. Smith, Ark." is on the back. Their name in one form or another appears on all tickets through 2005. If one flips the stub over, the diagram of the track is "upside down" - it is like that for all years through 1941 except 1939. Note that the word "Press" is in place of a dollar amount. Also note that the "Complimentary" general admission is stamped "EMPLOYEE" on the back. 1936 through 1941 retain the same format, dimensions etc. as 1935. In 1938 a legal statement is added to the back in the middle, the printer name is on the front of the 1939 and there is no printer listed for 1941. Unused tickets from this era have a perforation between the gateman’s stub and the rain check, but not between the gateman’s stub and the portion to the left. Note there is a serial number on the 1938, 1939 and 1940 grandstand “Bleacher” tickets. The 1937 "Complimentary" general admission is stamped "EMPLOYEE" similar to the 1935. Note on the 1937, 1939 and 1941 unused general admission “Press” and “Complimentary” tickets the serial number has been punched in the ticket under “Ticket No.” along with an extra number in the far right column. 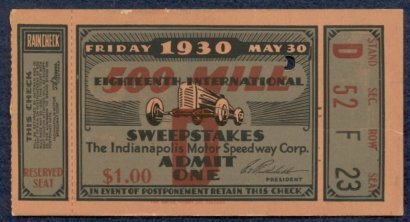 Although it’s a bit hard to tell, it appears as if serial number has not been punched on the 1941 unused General admission “Press” ticket which indicates it may not have been “used” on race day. 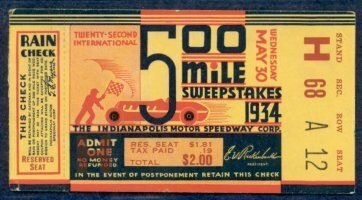 Since the United States entered World War II on December 7th, 1941 the 1942 ticket shown below was more than likely printed before this date and is a sample or a "proof" which would've been sent to the Speedway for approval. Note that there is no "box" designated and there is no slot for a "seat" number printed (as on the 1946). Also, expect for the date change and the type of font used for the date, it is virtually identical to a 1946 and is so in size. 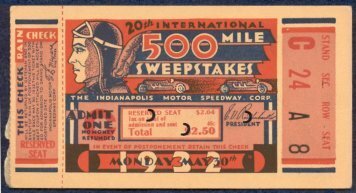 As the Speedway shut down for the duration of WWII, it is guessed 1942 tickets were never printed or issued in quantity and if any were, they more than likely would've been destroyed as there was to be no 1942 race. Therefore, this 1942 ticket is extremely rare and may be unique with an uncertain value. In general, tickets from this era are hard to find. Stubs from 1937 and before seem to be harder to find than than 1938 through 1941.